We are aware that the company trading as ‘TVArabia HD Box’ for arabic channels in Australia has suddenly disappeared, with no warning or reason provided to their customers. Please note: BeamARABIA is NOT affiliated with TVArabia – we are not the same company, and have zero ties with that company. It has been brought to our attention that their website tvarabia.com.au leads to a blank page. We have also been notified that their facebook page https://www.facebook.com/tvarabia has also been taken down, and phone calls are no longer being answered. We have been informed by some TVArabia customers that their channels have stopped working, while others have noted that the channels are still working for them – we are here to help those affected, as we understand that many have lost money in this ordeal. First, we need to confirm if your box is ANDROID, or Linux ? (if you are not sure, you can send us a picture of your box, and also a picture of the tv screen of your box > we will then know which system it is). TVArabia used to sell ‘Linux’ boxes first, for a very long time. So if your box is very old, it is most likely ‘Linux’. The Linux box does not have ‘google play store’ app, this is one way you can know if it is linux box. If you purchased the box recently, then it will most likely be an ANDROID box. If it is a Linux box, then unfortunately our app & service is not compatible on this box, and will not work on it. If this is the case, then we can offer to exchange your box for a new BeamARABIA package with a generous discount (read below for more details about this offer). If your box is using ANDROID, then you don’t need to buy another box from us to watch the Arabic channels. Instead, you can simply purchase our Arabic IPTV APK (our app) and service and use it on your own box. This way it will be more cost effective for you, and you will save money. Our app/service will work on ANY ANDROID TV BOX. 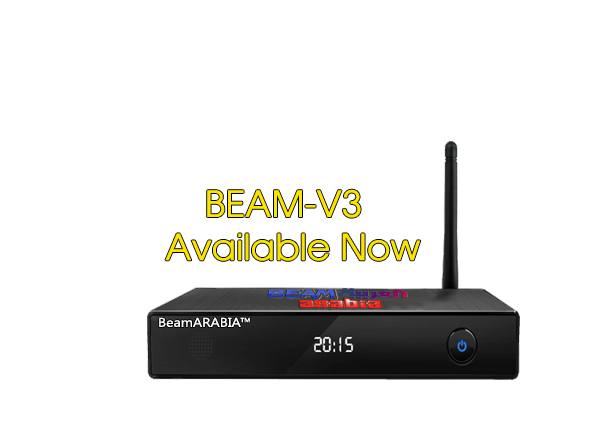 For TVArabia customers we are offering for a limited time only, a generous $70 discount > which means you get the brand new BeamARABIA package (including the new BeamARABIA V3 metal box, HDMI cable, remote control etc) with 2 years subscription for only $280 (but you need to send us your TVArabia box for this exchange program). > we provide free shipping Australia-wide. exchange program. It is totally up to the dealer/retailer. Contact us for more information.